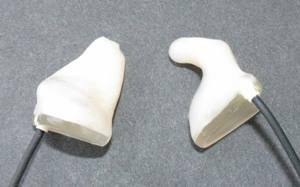 Over the years Avery Sound Company has received a lot of requests for an upgraded version of our Race Ear product. 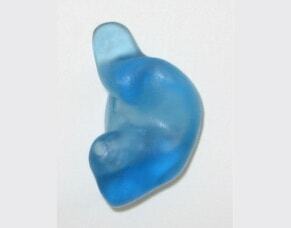 We are pleased to now offer our custom molded HiFi Earphones. 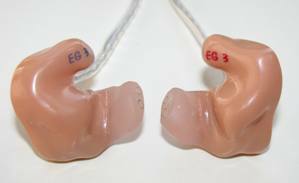 These earphones are fully integrated and contain the same dual drivers (speakers) found in the very popular Shure E5 earphones. Our HiFi Earphones have a minimum 36" cord and a 3.5mm stereo plug which is standard for the iPod and most other MP3 players. The actual cord color and plug style may vary. 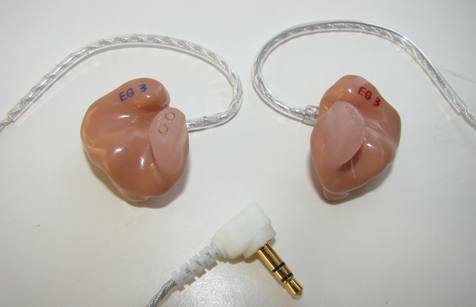 The earpieces are available in beige or clear. For the professional musician looking for top of the line performance we offer our custom molded Triple Driver Musician Earphones. These earphones are fully integrated and contain three top of the line Knowles drivers. Our Musician Earphones have a minimum 36" cord and a 3.5mm stereo plug. The actual cord color and plug style may vary. 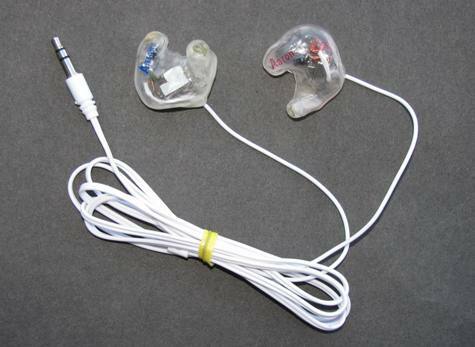 The earpieces are available in beige or clear. To obtain a full frequency response and maximum sound isolation for the HiFi Earphones or Musician Earphones it is recommended that the user obtain deep impressions. Our at-home kit provides a very good shallow impression but for peak performance a deep impression is required. In most areas of the country these impressions can be obtained for a charge of between $30.00 and $40.00 for the set. Any hearing aid center or audiologist can make deep impressions for you. The process is quick and painless and does provide a superior impression for high end users. 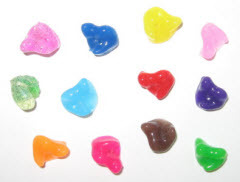 Audio Earpieces can be ordered in a wide variety of colors. If no color is selected the earpiece will have a variable tan color. (The material does not cure perfectly clear.) There is even a glitter option for that personalized touch. 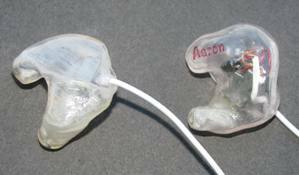 Which Custom Molded HiFi models will work with the Avery Sound Custom Earpiece? 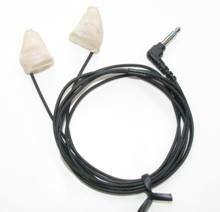 The earpiece is not only custom fit for your ear but is custom fit for the specific Custom Molded HiFi model. 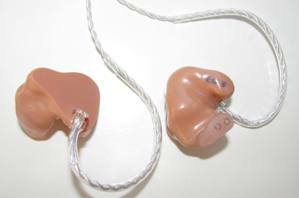 Shown below are examples of Custom Molded HiFi models with custom earpieces. If you do not see your model pictured send us an e-mail. We are adding new models every month. 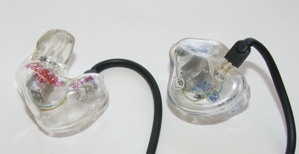 The HiFi Earphones are available in a canal only style as shown to the right. The set to the right is made in beige which will hide the electronics. The HiFi Earphones can also be ordered in a full shell format and can have your name stencilled on the earpieces. The back and front side of a set in clear is shown to the right. The Musician Earphones have canals made of a special material that help seal the ear canal and provide optimum comfort and performance. The Musician Earphones have detachable high quality wires and the earphones come with a back up set of wires. The back and front side of a set of monitors in beige color is shown here. A set of earphones in no color. This set is shown with the black style cord. I did receive the HiFi Earphones and…wow! No, let me re-phrase that…WOW!!! These earphones are the answer to my long-standing problem of not being able to hear either music or cell phone at 70 MPH on my motorcycle. I must apologize for my delay in writing this email but I wanted to thank you very much. Your customer service was spot on and the product you recommended, hard molded twin drive headphones, have been spectacular. They provide accurate and wonderful sound with extraordinary noise blocking that does not require loud volumes unless I choose to turn it up and rock out. They have been great as a casual user, music lover, and even in studio and live music settings. Thank you again for helping me make this decision. I think you offer a wonderful product and outstanding service! Thank you again for calling me yesterday about my ear monitors. As you expected, they arrived yesterday and I was able to use them at a gig last night. They were excellent! I'm very satisfied. Thanks for recommending this product. It is a great, affordable alternative. Also, thanks for your consistent level of customer service. You went above and beyond in helping me before and after my purchase. I'll definitely recommend Avery Sound to my friends.